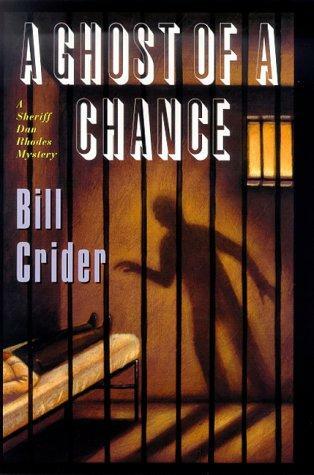 A Ghost of a Chance in another book in Bill Crider’s long-running Sheriff Dan Rhodes mystery series, and it’s a pleasant return to fictional Blacklin County, even though there’s all that death and shooting with intent to kill that follows. The author always tosses out a few mysteries that end up getting solved with homespun logic with a touch of brilliance. I love Crider’s male heroes because they are men that I can easily understand. They’re complicated, and deep, but they’re complicated in ways that I value. Sheriff Rhodes, for example, really tries to live an easygoing life. Murder isn’t the only thing that gets in the way, though. There is a lot of friction with the other characters of the small sheriff’s office, including the dispatcher Hack Jensen and Lawton, the jailer. The two old men constantly bicker and drive Rhodes nuts. This book opens with them arguing over whether or not the jail is haunted. Evidently, there have been stories for years. This seemingly innocuous beginning is one of the main mysteries throughout the book that ties everything else together. As an author, Crider is sly like that, and through Rhodes he has one of his greatest foils. The sheriff sees things other characters in the books don’t, but that’s only because Crider himself sees those things. On the surface, A Ghost of a Chance seems like a simple, straightforward mystery. While the two old men are discussing whether not ghosts are in the jail, a call comes into the sheriff’s office concerning a dead man found in a newly opened grave. The grave wasn’t scheduled to be used till the following day, and it was intended for someone else. Once Ty Berry turns up dead, Rhodes starts tracking the murderer. The trail winds through a series of crimes involving the theft of gravestones (something that is very real these days and I didn’t know about), antiques, chicken fried steaks, an outlaw family, and surly bikers. Fans of the series will look forward to Rhodes’s latest encounter with Rapper and Nellie, the two lone motorcycle outlaws that the sheriff has had problems with in the past. Things always get sideways with Rapper and Nellie in the picture, and this time is no different. There’s not another writer I can think of who can mix in the lowbrow criminals, a flock of emus, local color, orphan kitties, and Dr Pepper quite the way Bill Crider can. Opening a Dan Rhodes mystery is like sitting down across from the sheriff and letting him tell you about his day. The laconic way the narrative drives the story makes the tale endearing. Even though he’s in the backwoods, Rhodes doesn’t find the living easy, and murder is as complicated in Blacklin County as it is in any of the big cities. It’s also as dangerous. Rhodes and his deputy Ruth have quite the shootout at one point, and the sheriff handles himself quite well. The mystery is nice, the pacing is a curious blend between cozy and procedural that sets the series apart in the mystery market, and Rhodes is a character you’ll be rooting for from the first page. If you read the Rhodes series before, you know what I’m talking about. If not, this book would be a great place to jump on. Crider writes his series so that anyone can jump in at any time. Of course, the character grows and changes over the course of the novels, but the way the narrative is set up you can easily read the older stories and feel like you’re just getting a story from an earlier time, without feeling that you have missed anything. This entry was posted on June 16, 2012 at 9:45 am and filed under Crime,detective,Mystery,series fiction. You can follow any responses to this entry through the RSS feed.